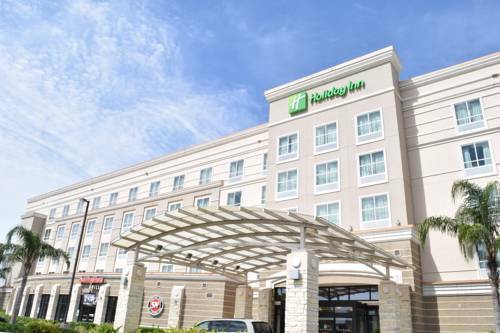 Guests Love Our West Houston Hotel's Full Service Located in the Energy Corridor of West Houston, the full-service Holiday Inn Houston West - Energy Corridor hotel promised a warm welcome, efficient check-in and upgraded amenities designed to offer convenience and comfort. Business guests love our West Houston hotel location. ExxonMobil, CITGO, BP, Shell, ConocoPhillips and other energy companies are nearby. Gulf States Toyota, Worley Parsons and Sysco are also easy to reach. As one of the leading hotels in Houston, Texas, we meet your business needs with 2,000 sq ft of meeting space, an experienced staff and a 24-hour, fully-equipped Business Center. Free wired and Wi-Fi Internet access keeps you connected during your stay in Houston. Our hotel is the right choice if you're here for fun. Guests can shop at Houston Galleria or the Katy Mills malls. Forbidden Gardens, Baseball USA and the Great Southwest Equestrian Center offer something for everyone in West Houston. Our hotel guests love the pampering they receive when they choose one of our spacious rooms with free Wi-Fi access and a 37-inch flat panel TV. Take advantage of the complimentary shuttle service to any destination within five miles of the hotel. Let our Executive Chef tempt your taste buds with a meal at our Sporting News Bar & Grill; or enjoy a drink while you watch one of the 13 large screen TVs for news and sports. We look forward to welcoming you to our Houston hotel! The Energy Ballroom is 2100 sq ft and can accomodate up to 120 ppl based upon your set up.